the Department of Telecom (DoT) and Unique Identity Authority of India said in a joint statement Thursday. 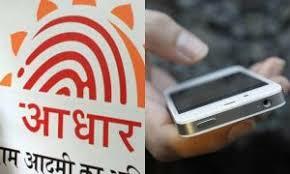 The joint statement said, the Supreme Court has prohibited issue of new SIM cards through Aadhaar eKYC authentication process and there is no direction to deactivate the old mobile phones. "Hon'ble Supreme Court in its judgement in Aadhaar case has nowhere directed that the mobile number which has been issued through Aadhaar eKYC has to be disconnected. Therefore, there is absolutely no reason for panic or fear at all," the joint statement by the two government bodies said. There are speculations that subscribers enrolled through Aadhaar-based authentication process may have to provide fresh documents to complete their Know Your Customer (KYC) process again, as a Supreme Court judgement has restricted the use of Aadhaar-based verification by private entities. The Unique Identification Authority of India (UIDAI) had given time till October 15, to telecom operators for complying with the apex court order and asked them to close Aadhaar-based verification for their services. "in the light of the verdict if anybody wishes to get her or his Aadhaar eKYC replaced by the fresh KYC, she or he may request the service provider for de-linking of their Aadhaar by submitting fresh OVDs (official valid documents) as per earlier DoT circulars on mobile KYC. But in any case his mobile number will not be disconnected," the statement said. It further noted that the Court has not asked to delete all the eKYC data of telecom customers after six months but has asked that UIDAI should not keep authentication log for more than six months. "The restriction is on UIDAI and not on the telecom companies. Therefore there is no need for telecom companies to delete authentication logs," the statement said. Don't you think, your paper documents can be used for bringing out new sim cards, am having fear that again paper documentation will lead to buy new sim cards in our name which will be used by someone else. Miss use of paper documents will happen by unauthorized person, such as people who do fake calls and say your debit card is blocked and to open that one they need card number and CVV and OTP. They will not get caught because they will get new sim cards in my or your name with duplication of documents.People from other countries can't buy sim cards and same time they have been provided by shopkeeper by paying more money, what you think where this shopkeeper get documents, they all uses my or your documents to give them sim cards. After use of Adhaar based activation fake calls have reduced, Am sure no one will provide his/her finger to activate sim card if someone unknown will ask . But duplication of paper documents can easily happen. It's time to think and recall 2yrs back situation, when paper documents been used. There should be alternate ad adhaar, can be Fingure based DL or Voter I'd to take sim connection instead of asking for my document photo copy.